Coming to the back half of February, we concede that yet another summer season is coming to an end. Though the warm should stay with us for a few weeks more, it is around this time Australian golf courses will be getting ready to complete their end-of-summer renovations to prepare for the cooler months to come. 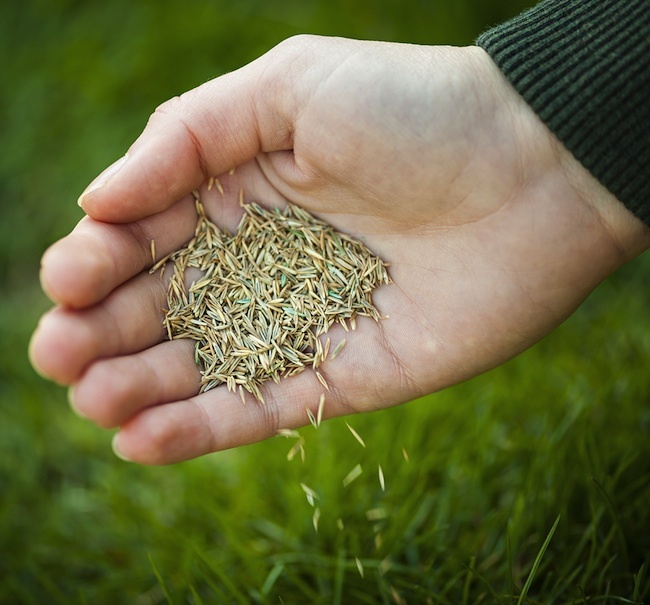 Another practice that, though common in use, is not quite as well known as the renovations process is the spreading of cool season grass seeds across fairways and tees as a way of bolstering growth in winter. This practice is particularly common on the northern east coast of Australia where Couch species are commonly used on fairways and rough areas across golf courses. ‘Over sowing’ is the commonly used vernacular for such a technique and Rye seed is generally the species of choice to give these courses a kick along in winter. Ryegrasses are one of the most widely grown winter species in the world and are characterised by their thin leaf and dark green pigment. Rye is particularly well suited to golf courses as they respond to environments with well-drained soil; as golf courses often aerate and irrigate their grounds they create beneficial growing conditions for the various tuft-grass species which all come under the Rye genus. Rye does require regular irrigation to thrive but provided this condition is met these species take root quite quickly. In warmer, moderately tropical regions such as Queensland a common Couch is an ideal grass for the spread of a golf course. It is robust and its broad leaf can handle more wear from vehicles and foot traffic. The leaf doesn’t make it a great species for the green but provided that encroachment measures are taken it works well around the surrounds and is good for fairways. 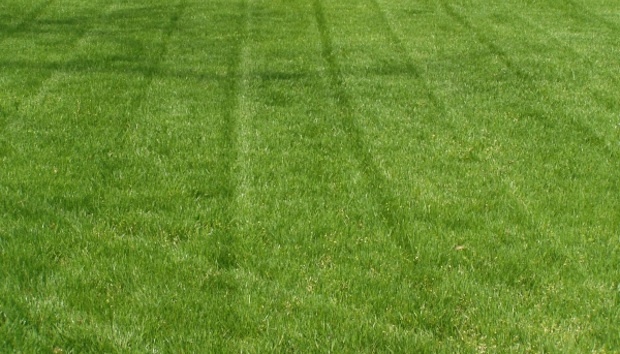 It does however tend to go dormant in the winter, which makes it more susceptible to wearing and brown patches. It doesn’t rejuvenate as well in cool conditions and can lose its green pigment without the aid of warmer temperatures. This is why Rye grass is the perfect compliment to Couch fairways. Though there may not be enough time in a Queensland winter for Rye grass to take over a Couch fairway or tee, it does provide much needed growth for the 10-12 week period where Couch struggles to grow. Native to Europe, various Rye species are found throughout the continent but have also been exported all over the world; used in sports turf projects as well as farming and agriculture – being useful for the growing and harvesting of hay. Two of the most commonly used Rye species are Italian Rye (Lolium perenne L.) and Perennial ryegrass (Lolium perenne L.). Though each species require slightly different conditions to reach their flowering phases – and therefore drop fresh seeds for further growth – these conditions are generally not available in the Queensland climate cycle so annual seeding is required to reapply the species for each cool season. For small areas such as surrounds and tees a common fertiliser spreader works fine for the application of Ryegrass. Unlike fertilisers and other chemicals, the exact measurement of rye is not as high a priority. 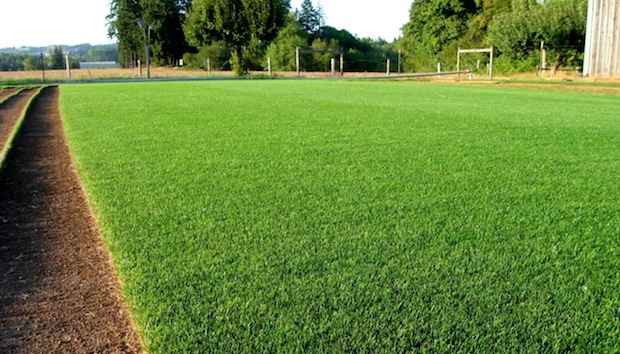 However it is important not to saturate the area to the extent that it will compromise surface for quality of play. Generally, two runs on a medium spreader setting should suffice for any area, but be aware of the risk of overlapping spreader spray from parallel runs. This could result in a series of lines of dark green growth as there may be a higher ratio of rye seed to couch in these areas. 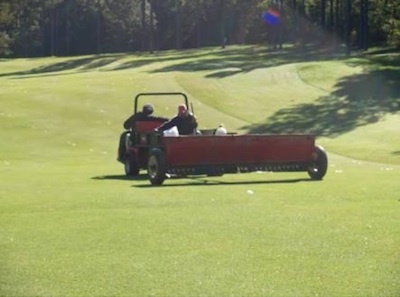 For fairways, though a manual spreader could be used (if, for example you are disciplining an insubordinate apprentice) it is far more efficient to employ the function of a larger spreader attached to a tractor or Toro/John Deere/Jacobsen vehicle. The same concerns exist for overlapping the spray of the seed but otherwise it should make for a quick application process across the course. Once the Rye seed has taken root it will grow a tall, thin leaf which will protrude well above the Couch. For this reason you may have to adjust your winter cutting schedule to make sure your fairways are nice and even. For the green and tee surrounds, where a cylinder mower such as a Triplex or Sidewinder may be used, consider changing to a rotary machine whilst using Rye as the thin leaf will often bend under the cylinder blades and not cut evenly. This process is not used as much in southern states such as Victoria, where Rye grass is often used as the main species. But for warmer climates this procedure is very useful in battling the winter periods to help stimulate growth in the cool weather. Any articles / case studies of Over Sowing Couch Football Ovals with Cool Season Grasses in Melbourne to avoid the issues associated with Couch dormancy in Winter.